I drove into the mountains along the scenic Payette River to a ladies retreat on Friday with my daughter and her 6 month old. Being at a mountain retreat is a favorite thing of mine. What could be better than visiting with other women, sharing meals together and listening to an amazing speaker? And the music. Love. Hearing dozens of voices in harmony. My daughter was playing bass. There was also a guitar, keyboard and a friend of mine on violin. She doesn't ever use music with her violin but plays by ear as if the violin is a part of her. One can just shut their eyes and listen to all the parts. The speaker shared about not just loving God above all else but that we also need to love our neighbors. Really love them. Not get irritated because the neighbors have 10 cars or their dog barks all day. A more practical approach like learning all their names, making sure they know they can count on you if they need to and truly showing you care. NO MATTER WHAT. I have to admit it is so easy to go inside, close the door and not want to talk to someone but that does not show compassion to them. In Matthew 22:37-38 Jesus answers the Pharisees when they are trying to put His knowledge to the test. He answers them by saying, "You shall love the Lord you God with all your heart, and with all your soul, and with all your mind. 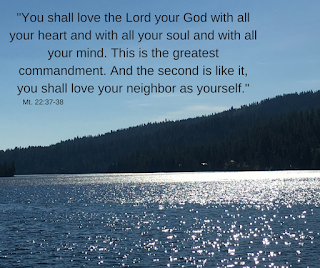 This is the great commandment. 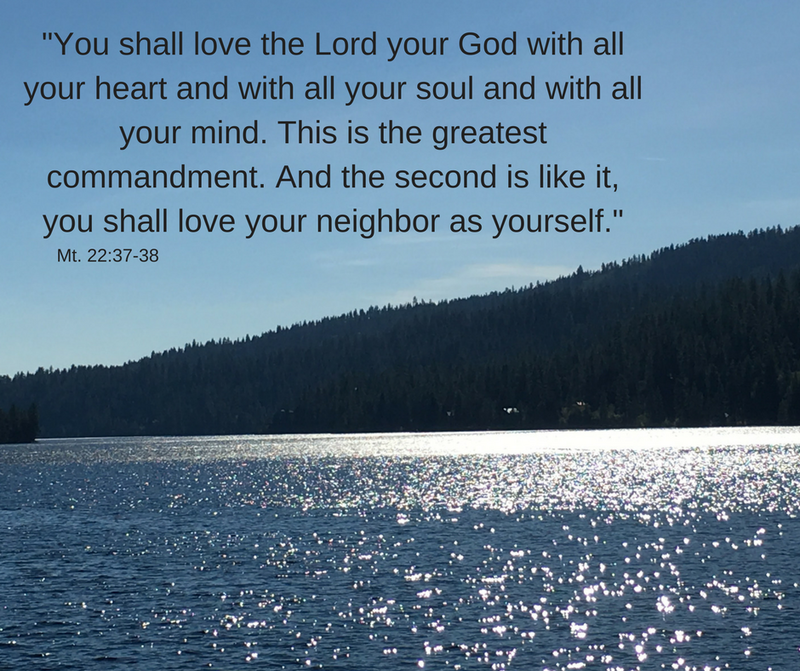 The second is like it, You shall love your neighbor as yourself." Hmmm... that is pretty strong instruction to us. Clear and concise. Right to the point. I have some work to do. I know a few on my street, but only half. I am going to pray for opportunities to show others Christ's love. It may take awhile but I can at least improve. I would encourage you to reach out to those around you. Meet at least one new person this week. It's great to learn when we hear an encouraging speaker talk at a retreat or conference but we need to apply because we so soon forget. Blessings to you. Let me know ways you have reached out to your neighbor. I love your thoughts here! I was challenged to get to know my neighbors better, as well! I enjoyed our visit at the retreat - God bless you as you live fully the life & pursue the goals that God has given you! To God be the glory!